Our passion is sharing our love for Maui with you. When we came to Maui in 2001, we couldn’t think of anything better than spending our days on the water as a family showing people what we loved most – the underwater world of coral, fish, turtles and other marine life, and cruising the tropical teal waters with views of white sand beaches and mountainous islands. 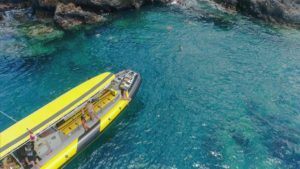 Today our family is blessed to have welcome thousands of people onto the No Ka Oi and into the Maui Snorkel Charters ‘ohana. We’re grateful for the new friendships we’ve made with guests who return year after year. Our guiding principles of safety, comfort, and FUN make each trip the Best Day Ever and keep people coming back for more. Your safety is always the first thing on our mind. Our boat was designed with high tech safety features such as prop guards, foam air hybrid collars, JPO joystick control for quick and effortless maneuverability, and three sets of padded stairs—not ladders—for ease of getting in and out of the water. We choose to have more crew than most boats our size to ensure your safety while on board and in the water. Unlike other boats, we have a lifeguard in the water with you at all times. You won’t feel cramped, hurried, or hungry on your adventure with us. We purposely don’t max out the capacity of our boat so you can lounge and easily move around under a full size cover, which ensures you always have a spot to take a break from the sun. The fun is the easy part! You’ll snorkel the best spots on Maui … all while taking in the playful antics of spinner dolphins and seasonal humpback whales. Our unique Seafari™experience – snorkel in one area then drift to spots nearby – makes your trip an adventure you’ll never forget. 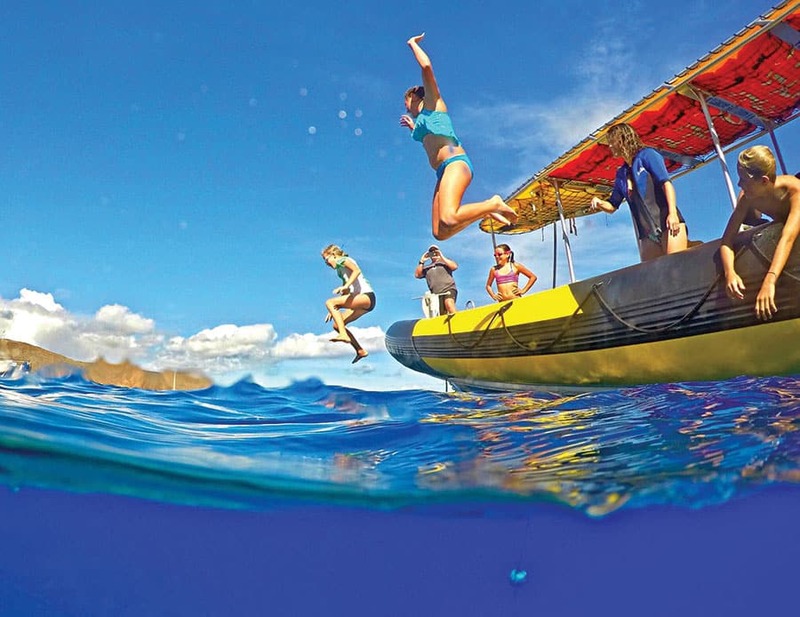 Come cruise around on the fastest snorkel boat on Maui with a small group of new friends. You’ll be sharing selfies and throwing shakas in no time. It’s all part of the Best Day Ever! Our whole day is about hitting the best spots… but the other boats that carry up to 150 people have the same goal, so our philosophy is to hit the best spots, weather permitting, but to avoid the crowds. With our seafari approach, we start the snorkel at one spot and the boat drifts closely by you as you move from one spot to another, visiting between 2 and 6 sites that other boats list as separate stops. This efficient approach allows you to see more without wearing yourself out by swimming back to and getting on and off the boat. Our smaller boat allows us to maneuver around the big crowds to show you the most unique spots and take you to areas that are inaccessible to the big boats. During your seafari, one of our guides is always in the water with you pointing out sites and making sure you are safe, while the captain and second crew member are keeping an eye on you from the boat. Should you get cold or tired, our boat can easily swoop in to pick you up and you can hang out on the boat for the rest of the tour or jump back in when you’re ready… the call is yours! We proudly ‘overstaff’ our boat by U.S. Coast Guard (and Maui) standards to ensure your safety and comfort. And by having three sets of eyes on you and the ocean, we make sure you don’t swim right by a cool, but hidden site or creature. We’re proud to be family owned and operated. Owners Doug and Tricia along with our daughters, niece, and hānai (adopted) family make up the No Ka Oi crew. Water enthusiasts with a wide array of knowledge and experience, we focus on safety, comfort and fun and do whatever we can to ensure you have the Best Day Ever! Things like making sure your gear fits properly to snorkeling alongside you to point out things you might miss are touches that make our trips extra special. Our crew members love what they do and put the Aloha in every adventure. Captain Doug has played and worked on boats his entire life. 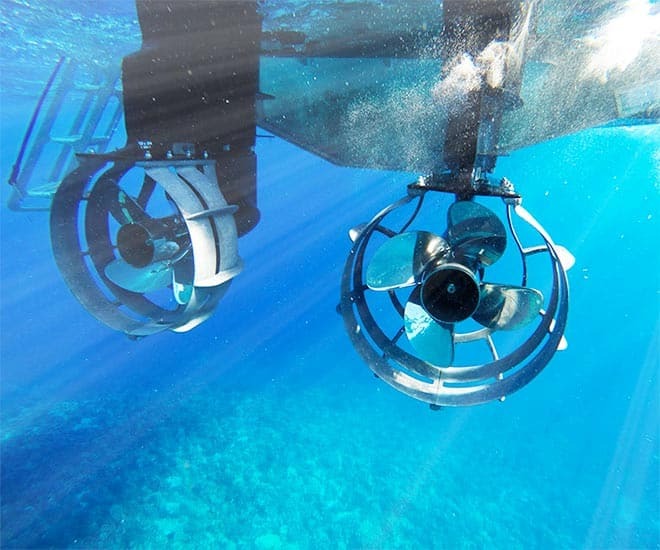 He loves spending his days behind the wheel of the Nō Ka ‘Oi, which he personally designed to host safe and comfortable snorkel tours with Maui’s unique ocean conditions in mind. His design was based on years of professional experience designing, constructing, and manufacturing boats. He is grateful to now spend his days on the boat with his family and guests swapping stories and smiles. Favorite Restaurant: Kihei Cafe, Cafe O’Lei, Fred’s Mexican Cafe, Monsoon, Sansei Sushi, Tiki Hut, L&L Barbecue, Ko, Tommy Bahamas… you get the idea! Favorite Way to Spend Time: On a Boat! From the time she was a baby, First Mate Tricia loved playing in lakes and rivers in her home state of Montana, but when she got her first dose of Vitamin Sea at 19, she was pretty nervous about being in the ocean. In fact, the first time she snorkeled she bit her mouthpiece off! 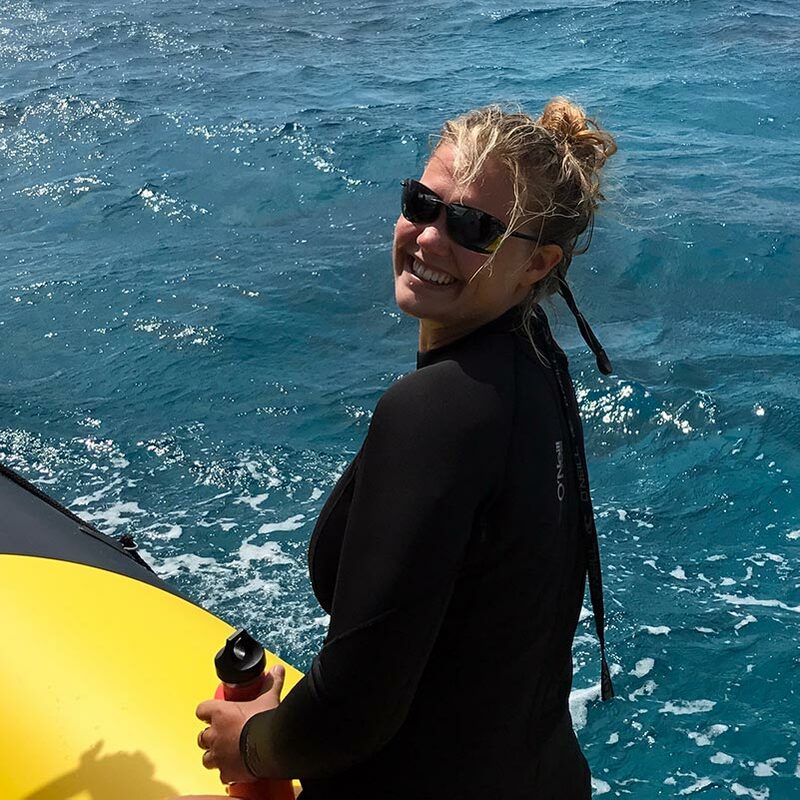 Now the ocean is her second home, but she recalls memories of those early days when she’s helping first time snorkelers get comfortable in the water so they can relax and enjoy exploring the wonders beneath the surface. Our niece Bailey found her forever home when she moved to Maui in 2015. She is passionate about the water and educating guests about the ocean’s endless wonders. Bailey loves to “nerd out,” as she calls it, about the behavior and interactions of fish and sea creatures. She recently acquired her U.S. Coast Guard Captain’s License. 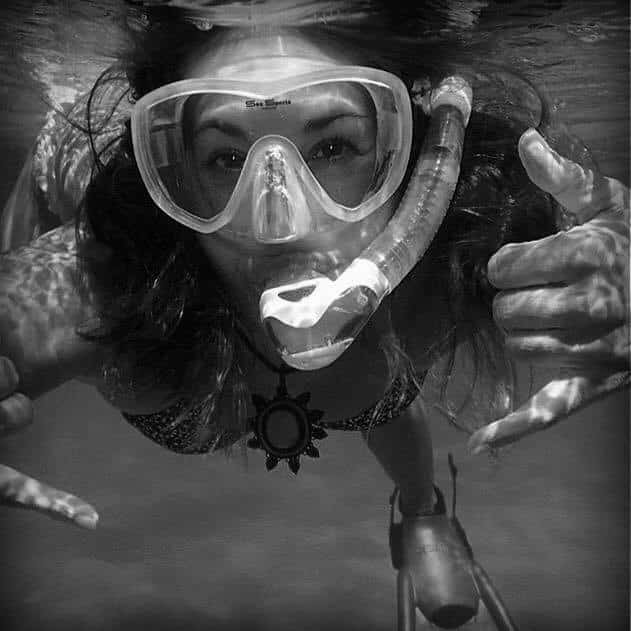 She loves that her family shares her passion for helping others experience the waters of Maui in a safe and environmentally friendly way. Our daughter Brittany came to Maui 3 years ago to get married and after falling in love with the beauty of Maui, she and her husband decided to stay! 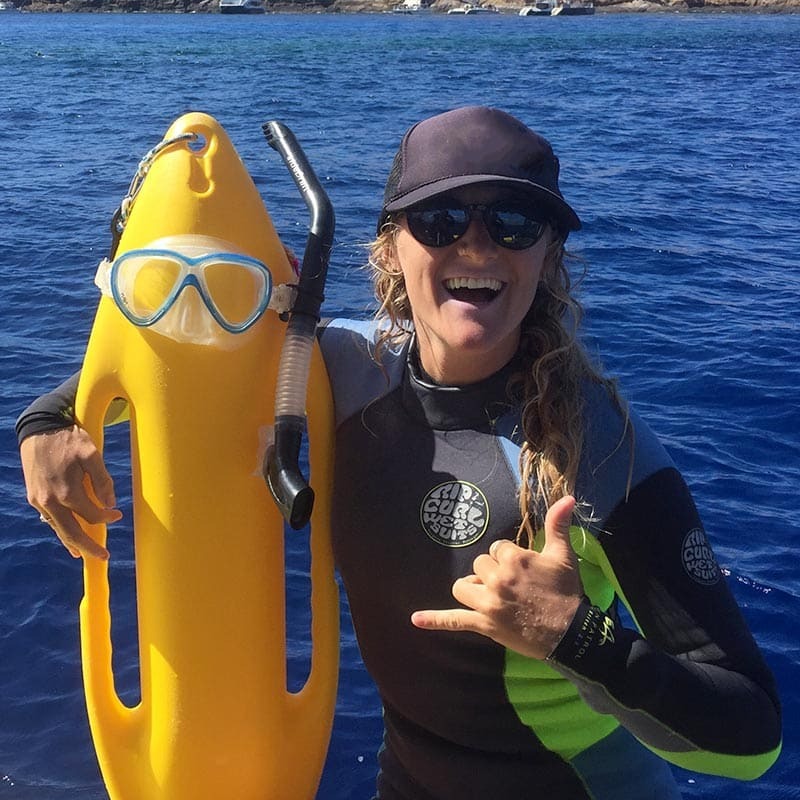 Prior to moving to Maui, Brittany enjoyed wake boarding and boating on the Puget Sound but life on Maui includes lots of time under the surface of the water. She loves seeing marine life and helping guests have that thrilling experience too. She feels blessed to be a part the family business! Our youngest daughter Leila was Maui Snorkel Charters first crew member. 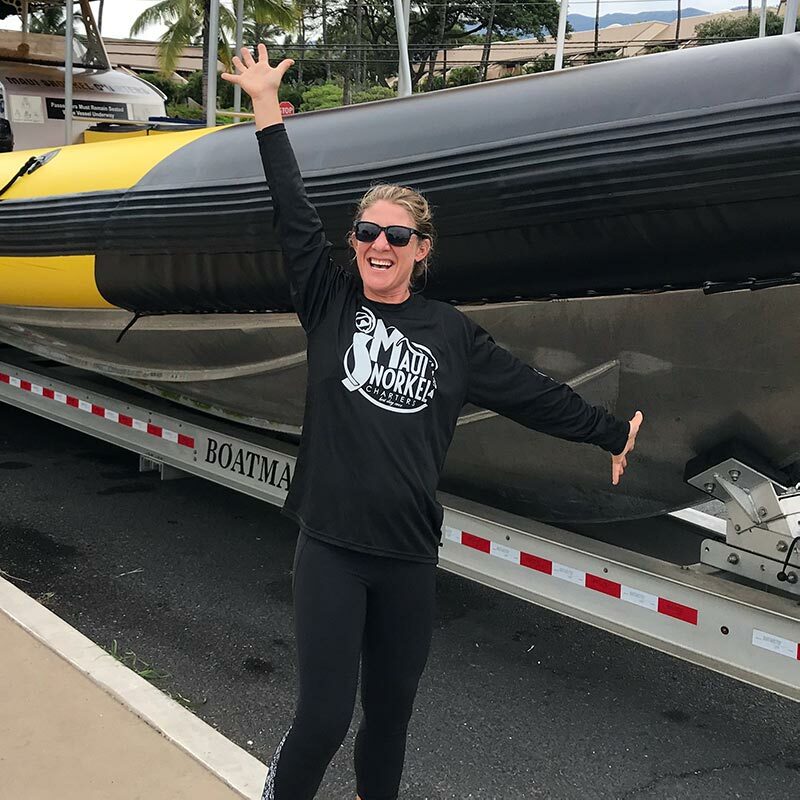 She’s an avid traveler but has decided to call Maui home for a while and is more excited than ever to be out on the water with you! Leila inherited her love for the ocean at a young age from her dad, and she feels fortunate to spend her days on the water with her parents and visitors, sharing her passion for the ocean, marine life and adventure! Kiera grew up traveling and this water-woman has spent the majority of her life sailing, scuba diving, wake boarding, paddle boarding, and jet boating. 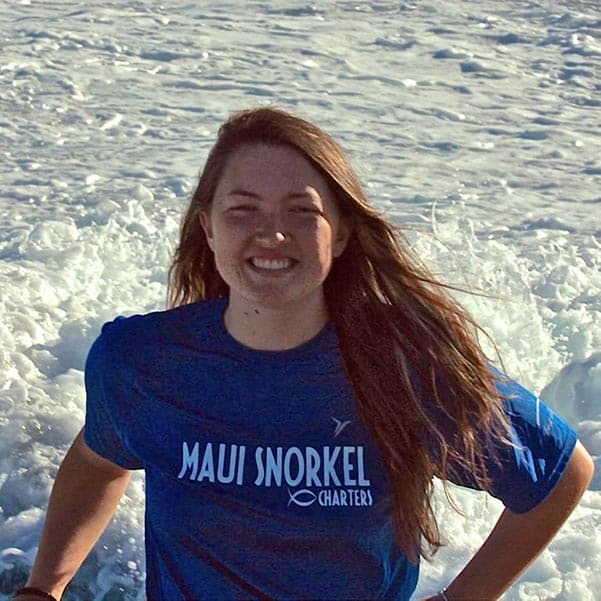 Since graduating from college, she’s been hard at work transforming her passion for ocean and land conservation into a career through an organization she founded called Protect Our Oceans, affectionately referred to as P.O.O. 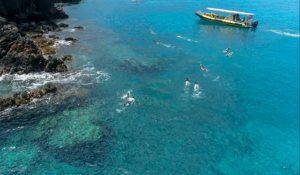 Maui Snorkel Charters proudly hosts reef cleanups for P.O.O. 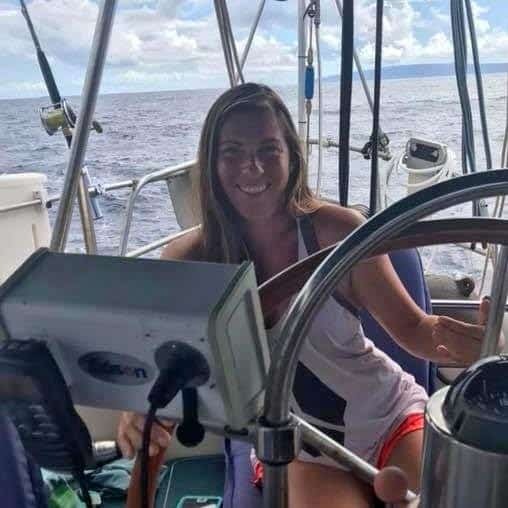 Kiera landed on Maui in 2015 and holds a 50 Ton Captain’s License. She’s pretty awesome! Mandy traded a business suit for a swimsuit five years ago and hasn’t looked back since. 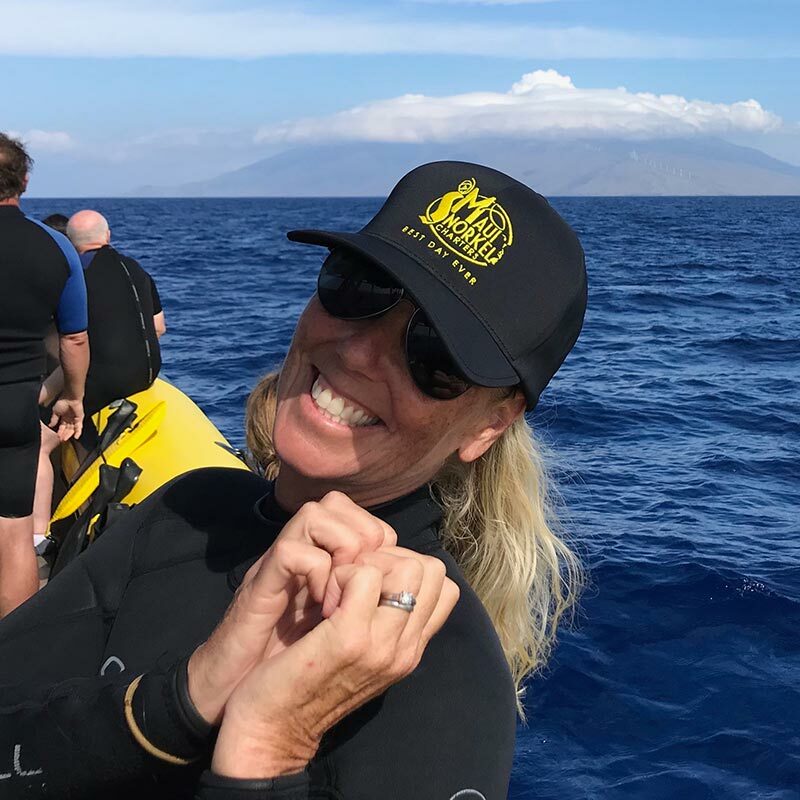 When she’s not guiding guests on an underwater seafari, she’s spends her time running, diving, paddling, hiking, traveling, and connecting with people about life experiences. Recently she spent time working on ships in beautiful Alaska and traveling through the eastern side of the African continent, working on sailing ships, ranching, volunteering, mountain climbing, and living in rural villages. Maui’s is the perfect playground for this nature lover! Mal has been living and loving life on Maui for the last six years. When she’s not on a boat, you can find Mal surfing, hiking or diving around the island. What she loves most about the ocean are magical moments like swimming with a manta ray, listening to whales sing underwater, or watching dolphins surf the boat wake. Every day at sea brings a new experience and she loves getting to revel in those special moments with guests. Yvette is a born and raised Texan who embodies the Aloha Spirit of the Hawaiian Islands (can we get an Aloha Y’all?!). She spends her time diving, trekking, educating others about marine life and marine conservation, volunteering, and teaching English as a second language. She loves to travel and has lived in Asia and South America and has plans to live abroad again someday. She loves learning about different cultures and seeing new species of marine life.